Constellation Virgo the Maiden, is an ecliptic constellation laying between constellation Leo and constellation Libra. Virgo spans over 50 degrees in the Zodiac in the Signs Virgo, Libra and Scorpio, and contains 12 named fixed stars. 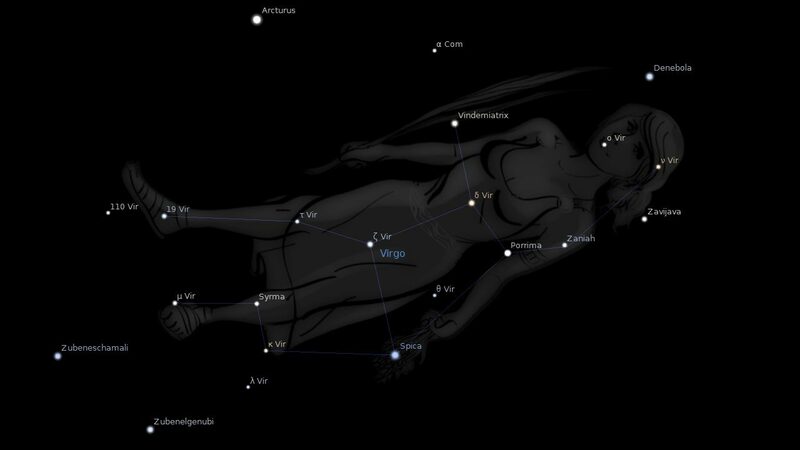 The Virgo constellation is said to represent Erigone, daughter of Icarius, who hanged herself through grief at the death of her father (Bootes). According to other accounts it is Astraea, daughter of one of the Titans, who sided with the Gods against her own father. and Albertus Magnus, of our 13th century, asserted that the Savior’s horoscope lay here. It has been said that her initials, MV, are the symbol for the sign ♍; although the International Dictionary considers this a monogram of Par, the first syllable of Parthenos, one of Virgo’s Greek titles; and others, a rude picturing of the wing of Istar, the divinity that the Semites assigned to its stars, and prominent in the Epic of Creation. In astrology this constellation and Gemini were the House of Mercury, Macrobius saying that the planet was created here; the association being plainly shown by the caduceus of that god, the herald’s trumpet entwined with serpents, instead of the palm branch, often represented in her left hand. 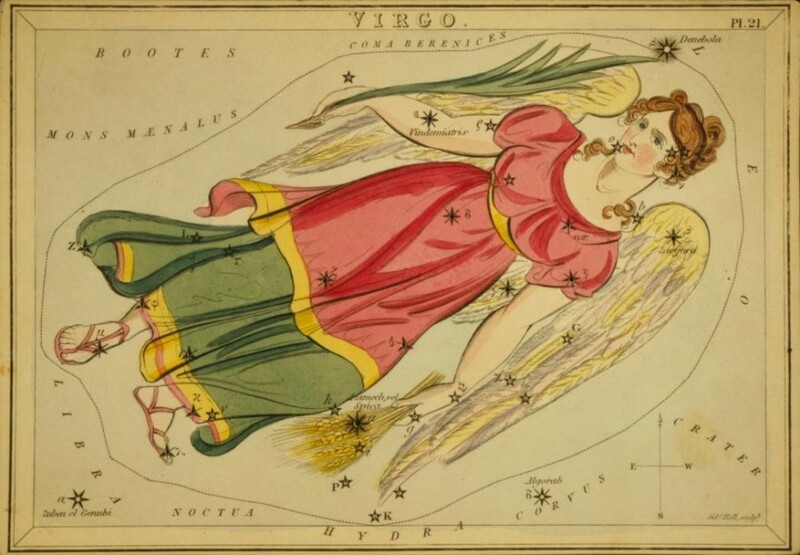 But usually, and far more appropriately, Virgo’s stars have been given over to the care of Ceres, her namesake, the long-time goddess of the harvest. For her astrological colors Virgo assumed black speckled with blue; and was thought of as governing the abdomen in the human body, and as bearing rule over Crete, Greece, Mesopotamia, Turkey, Jerusalem, Lyons, and Paris, but always as an unfortunate, sterile sign. Manilius asserted that in his day it ruled the fate of Arcadia, Caria, Ionia, Rhodes, and the Doric plains. Ampelius assigned to it the charge of the wind Argestes, that blew to the Romans from the west-southwest according to Vitruvius, or from the west-northwest according to Pliny. VIRGO is represented as a woman with a branch in her right hand, and some ears of corn in her left hand. Thus giving a two-fold testimony of the Coming One. The name of this sign in the Hebrew is Bethulah, which means a virgin, and in the Arabic a branch. The two words are connected, as in Latin–Virgo, which means a virgin; and virga, which means a branch (Vulg. Isa 11:1). Another name is Sunbul, Arabic, an ear of corn. It is difficult to separate the Virgin and her Seed in the prophecy; and so, here, we have first the sign VIRGO, where the name points to her as the prominent subject; while in the first of the three constellations of this sign, where the woman appears again, the name COMA points to the child as the great subject. Virgo contains 110 stars, viz., one of the 1st magnitude, six of the 3rd, ten of the 4th, etc. The star β is called Zavijaveh, which means the gloriously beautiful, as in Isaiah 4:2. The star ε, in the arm bearing the branch, is called Al Mureddin, which means who shall come down (as in Psa 72:8), or who shall have dominion. It is also known as Vindemiatrix, a Chaldee word which means the son, or branch, who cometh… The Greeks, ignorant of the Divine origin and teaching of the sign, represented Virgo as Ceres, with ears of corn in her hand. 1. Fixed Stars and Constellations in Astrology, Vivian E. Robson, 1923, p.66,67. 2. Star Names: Their Lore and Meaning, Richard H. Allen, 1889, p.460-465. 3. Astronomica, Manilius, 1st century AD, p.117,119,237,239,265. 4. The Witness of the Stars, E. W. Bullinger, 1. Virgo (the Virgin).